Automatic garage door systems are surprisingly complex. They can malfunction for a wide number of reasons. Don't go it alone; if mishandled, repairs can lead to serious injury. Leave it to one of our expert technicians to get your system working smoothly again. Identifying the root of an opener problem can be difficult. This is mainly due to the fact that the power and movement of your door is controlled by a complex mixture of mechanical and electrical components. Fortunately, you are not on your own when it comes to troubleshooting and repairing such problems. Our technicians can make on-the-spot repairs or replacements for malfunctioning circuit boards as well as worn out motor gears. We can also carry out comprehensive safety mechanism testing to ensure everything is working as it should do. Your garage door will not operate without fully functioning springs. The tension stored in your springs provides the counterforce which makes it possible to lift and lower your door. Should they snap, the broken coils can release a phenomenal amount of tension – they can violently whip around, risking injury to anyone nearby at the time. Therefore, it is extremely dangerous for you to attempt your own spring repairs or replacements. Don’t cause yourself unnecessary tension, call in the professionals! Our highly skilled technicians are well-experienced. Vertical and horizontal tracks guide your garage door up and down, smoothly and safely. Your door can get stuck or may even collapse should these components become misaligned, loose, rusted or bent. If this happens, it will take a skilled technician to straighten or realign them. So, when you need to get back on track, call a member of our knowledgeable team today. 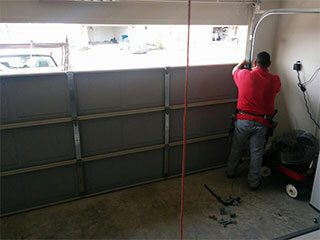 To get things running smoothly, contact Garage Door Repair Minnetonka today for the best service and professional assistance.